Clark Tracey’s latest band – the very youthful Quintet formed last year – is playing in the North East for the first time on 1 November at the Globe. This gig is expected to be one of the highlights of our opening season and we advise people to buy tickets in advance (£15 + £1.75 fee) from www.skiddle.com/e/12254835/ Tickets will be available on the door if it’s not sold out. Clark Tracey has long been regarded as the UK’s most accomplished straight-ahead jazz drummer. He’s also a composer, arranger, educator and talent-spotter. All of these skills come together in another of his passions: band leading. Clark has been fronting his own units since the early 1980s. 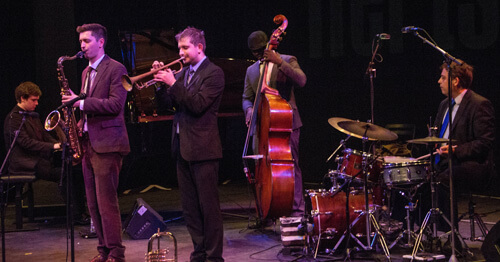 His new quintet brings together some of the brightest young stars on the British jazz circuit.